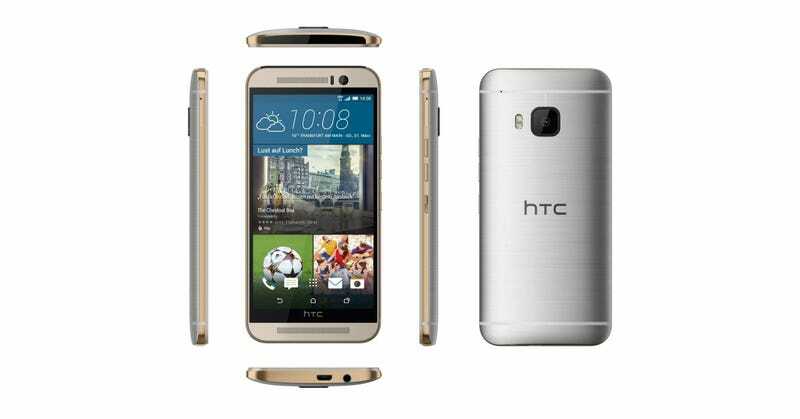 HTC's flagship phone, the One M9, is due to be announced a little over a week from now at Mobile World Congress in Barcelona. You don't have to wait to see it though, a new leak from Mobile Geeks looks to be preeeeetty on the money. The new images came from a few early online listings, so they're probably pretty accurate, and the show the new metal phone from all sides, confirming a few things that had already been rumored. You can see that the Duo Camera is now gone, and that otherwise the One's metal design has remained mostly unchanged. And no, it's not getting any bigger, the HTC One will stay the same size. The listings also confirm a number of rumored specs; it looks like the One m9 will have the new Snapdragon 810 processor, 3GB of RAM, 32GB of storage (plus a MicroSD expansion slot), and a traditional 20MP camera on the back, while the front-facing cam reps HTC's UltraPixel tech.